Welcome to the blog of the New Library Professionals Network. Here, we are primarily concerned with all things library for new professionals. We are based in the North of England, however we encourage contributions from members across the country. The worker bee has been a symbol of Manchester since the Industrial Revolution. 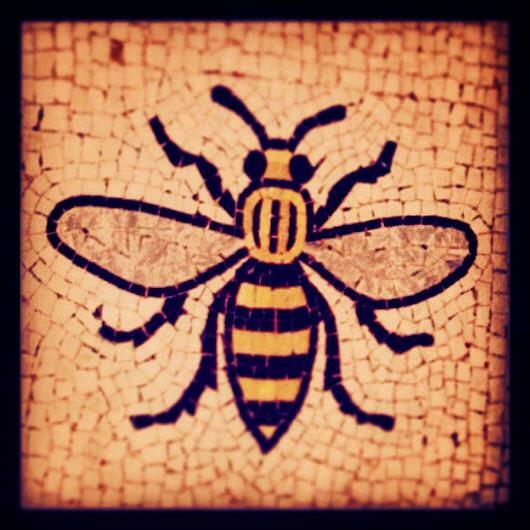 Bees can be found in Manchester’s crest, and take a wander around the city and you’ll find the bee on buildings, ballards and lamp posts.This mosaic can be found in Manchester’s town hall. Mancunians have long been busy bees and in this spirit NLPN will be keeping busy with library events!! NLPN was founded by 4 former MMU Library and Information Management students (Amy, Catherine, Helen & Siobhan). We were inspired to form the group after attending the 2012 CILIP New Professionals Day. The key messages of the day stressed the importance of local impact, getting involved and being proactive about your own professional development. We have continued to develop the network as we recognise that the information sector is constantly evolving and that many skill development sessions are often out of reach for most professionals due to costs or travel. Perhaps the first network you will be part of as an aspiring library professional is comprised of fellow students as you pursue the professional qualification. In our own recent experience, this has been invaluable. NLPN seeks to continue and expand on this initial network. Through looking at what we know and who we know, we can identify gaps in our professional knowledge and ways to fill them. This will be the guide for the events that we hold and the discussions that we generate. As well as information about our events, this blog will share advice and guidance discovered as we strive to attain the elusive first professional post and beyond. It will hopefully also be a forum to share your own experiences and ideas to shape the future of our profession.